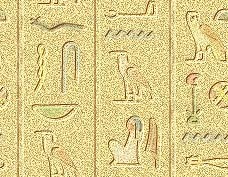 After over 170 years since the decipherment by Champollion of the ancient Egyptian hieroglyphs, inscriptions from antiquity continue to be discovered and old texts persist in yielding new insights. Some scripts such as Easter Island's rongo-rongo still seem to defy translation while the understanding of the ancient Mayan glyphs is beginning to flourish. The study of ancient languages and scripts is alive and well! My interest in languages is widespread and includes several European languages, Arabic, Hebrew, Akkadian, Sumerian and those of Polynesia, along with Ancient Egyptian, of course. Regarding the latter, I am involved in a study of ancient Egyptian funerary cones. These ceramic and typically cone-shaped (though by no means exclusively so) objects are stamped with biographical funerary inscriptions and appear to have been a component in tomb architecture although their full function and meaning remain enigmatic. The inscriptions are very useful and have been the focus of most studies but a consideration of these objects apart from the texts themselves is rarely undertaken. My present study of these interesting objects views them not only as inscriptions, but as three-dimensional artifacts with great variety in terms of size, shape, color, and material. An example of an Egyptian funerary cone text. 1987 "Inscribed Egyptian funerary cones in-situ: An early observation by Henry Salt." (with C.N. Reeves) Varia Aegyptiaca 3(1):47-49. 1988 "The archaeological analysis of inscribed Egyptian funerary cones." Varia Aegyptiaca 4(2):165-170. 1986 Book Review of: H.M. Stewart (1986), "Mummy cases and inscribed funerary cones in the Petrie collection." Varia Aegyptiaca 2(3):225-228. In preparation: "Corpus of Inscribed Egyptian funerary cones, Part II."